With tens of millions hopping on jets to get to summer vacation destinations, it’s worth noting that medical emergencies aloft aren’t as rare as many travelers might imagine — and it may be beneficial if a doctor happens to be aboard when the need arises. The nation’s top doctor, U.S. Surgeon General Jerome Adams, of course, may have spotlighted sky-high medical care, when he answered flight attendants’ emergency page to all those aboard a Delta flight from Fort Lauderdale to Atlanta. Details are a bit sketchy. But a passenger on the early May trip apparently passed out, and worried crew needed medical assistance and an evaluation of potential next steps. Adams said he was pleased to step up and assist the crew as the flight, which was on the tarmac, returned to the airport gate, where a crew member took the ailing passenger off for care, while the Delta plane resumed its planned trip. 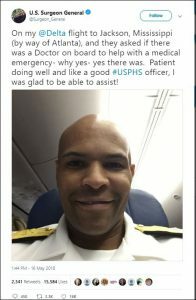 Though it might not seem so on the nation’s golf courses on sunny Wednesdays, doctors aren’t in abundant supply, and passengers aloft who get into medical trouble may not get urgent care from a doctor aboard, much less the Surgeon General. Instead, Bloomberg reported, airlines often must rely on medical consultants, who talk to flight crews, and, yes, sometimes medical personnel aboard, to evaluate cases and make treatment recommendations. Here’s where it gets complicated: What happens if there is a doctor on a flight and she disagrees with the consultant over the diagnosis or treatment plan? That scenario’s not so far-fetched and is at the heart of a lawsuit involving the already beleaguered United Airlines, under fire for various poor public relations black eyes like dragging a passenger off an over-booked flight and killing pets it’s transporting. Becker’s Hospital Review, a sector specialty publication, notes that airlines may hope that doctors aren’t aloft for medical emergencies, because that may give consultants more leeway in deciding whether to divert a flight. That occurs in 7.3 percent of cases, according to the New England Journal of Medicine study. Bloomberg reported that diverting a flight, depending on its passenger load and how far it has traveled, can cost anywhere from $10,000 to $200,000. The decision gets complicated because death rates from airborne medical emergencies are rare, occurring in just .3 percent of reported cases. But, still …. In my practice, I see not only the harms that patients suffer while seeking medical services but also their struggles to access and afford safe, efficient, and excellent medical care, more often in offices and hospitals — not at a cruising altitude of 20,000 feet or more. Common sense and moderation can be helpful in many medical situations: Talk to your doctor and be frank and clear so you know if your health is good enough, so you can travel well. To be harsh but honest, air travel, stressful before, has become an ordeal these days, with jammed and off-schedule flights, unhappy and rude passengers, poor service, and even out-of-control “companion” animals. With summer travel at its peak, kid, could you stop kicking the back of my seat? Kidding. Regulators and lawmakers need to stay atop airlines to see that the skies stay blue, sunny, and friendly, including if passengers encounter medical emergencies, in which carriers’ financial considerations cannot be allowed to rule. Safe and healthy voyages, all!